A takeaway food business is always a great idea as food is a basic commodity. But with its huge market also comes huge competition. There are always other takeaway food companies that will rival yours, and people will always have to choose. This is just one of the reasons why getting a takeaway food business for sale in Victoria is a tricky endeavour. However, if you are planning to start a small business where you only face less competition, it’s a claw machine franchise. Claw machines are an unconventional business in this digital era, but they are always played without fail when placed in a populated site. 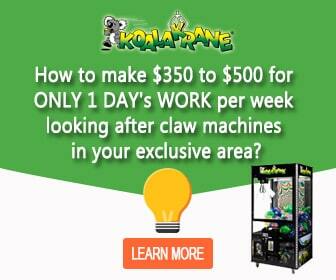 With Koalakrane, you will be operating your claw machines in an exclusive territory in Portland, Echuca, Mildura, Horsham, Swan Hill, Sale, Hamilton, Albury-Wodonga or any vacant franchise area, so you can be assured of an excellent profit. Experience a hassle-free, semi-passive business opportunity with Koalakrane. Enquire now and get a free quotation!